He was “the Father of the US Calvary” and President Polk named him “Commander of the Army of the West”. In 1848 he went from Santa Fe, NM on to CA with 100 men on an arduous trip across our desert and on to a battle at San Pascual in a fight for independence from Mexico. Erected 2006 by Barstow's Main Street Mural Project. Location. 34° 53.92′ N, 117° 1.517′ W. Marker is in Barstow, California, in San Bernardino County. Marker is on East Main Street (Business Interstate 15), on the right when traveling east. Touch for map. Marker is at or near this postal address: 222 East Main Street, Barstow CA 92311, United States of America. Touch for directions. (within shouting distance of this marker); The California Gold Rush (within shouting distance of this marker); Calico Mountain Mines (within shouting distance of this marker). Touch for a list and map of all markers in Barstow. 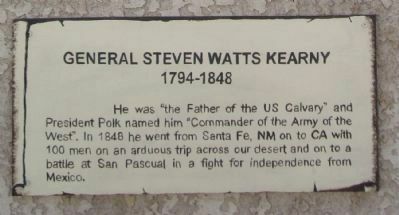 Regarding General Steven Watts Kearny. The Early Explorers is the subject of the sixth mural in the series. Barstow’s Main Street murals are intended to illustrate Barstow’s past and enhance its future. 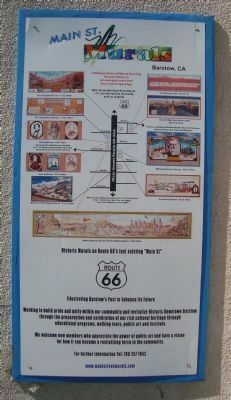 The murals line historic Route 66, the Mother Road. The murals depict aspects of the history of Barstow and the surrounding area. New murals are added annually. 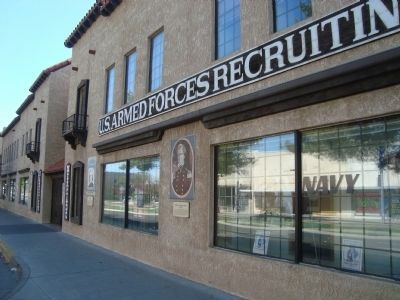 The marker is below the Armed Forces Recruiting sign. Working to build pride and unity within our community and revitalize Historic Downtown Barstow through the preservation and celebration of our rich cultural heritage through education programs, walking tours, public art and festivals. We welcome new members who appreciate the power of public art and have a vision for how it can become a revitalizing force in the community. More. 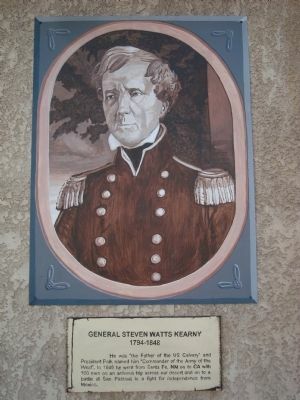 Search the internet for General Steven Watts Kearny. Credits. This page was last revised on June 16, 2016. This page originally submitted on December 16, 2011, by Barry Swackhamer of San Jose, California. This page has been viewed 613 times since then and 12 times this year. Photos: 1, 2, 3, 4. submitted on December 16, 2011, by Barry Swackhamer of San Jose, California. • Syd Whittle was the editor who published this page.